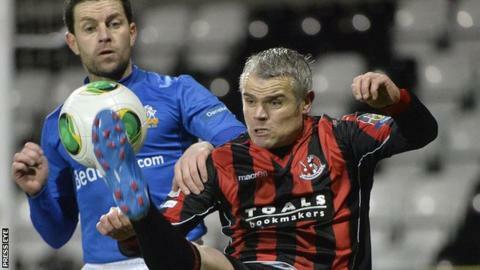 Gary McCutcheon has left Crusaders to rejoin Ballymena United until the end of the season. The 36-year-old Scottish striker played for the Sky Blues for two years before signing for Crusaders in 2012. McCutcheon will not be available for selection with Ballymena until the Premiership game against Glenavon at the Showgrounds on 3 January. He started is career with Kilmarnock and has also played in the Irish League with Larne and Portadown. McCutcheon scored 39 goals in 75 games in his first spell at Ballymena and was named Ulster Player of the Year for the 2011/12 season. The forward scored the only goal in Portadown's 1-0 win over Newry City in the 2009 League Cup final.